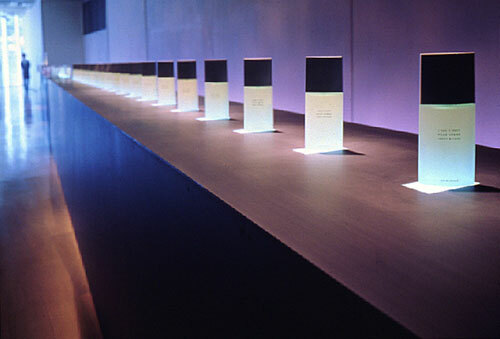 Domestic exhibition for L'EAU D'ISSEY (water of ISSEY), perfume for men. "Flow, Water, Light, Wind, and Scent". 20 bottles of perfume are placed on the windows of 20m-length steel box. 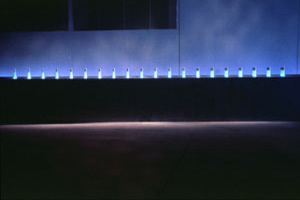 Each bottle is lighted up with an inside FL lamp of the box and a Halogen-spotlight from the ceiling. The basic light is sun streaming through the leaves of the trees to the floor and the wall. Day light changed gradually from morning with the sun movement. Simultaneously, drift of people and flow of fragrance created good atmosphere of the hall.